GOLD PRICES again held $5 per ounce lower for this week so far in London on Friday, trading just below $1313 as the US Dollar edged higher once more on the currency market. European stock markets fell for a second day, erasing the week’s earlier 1.9% on the EuroStoxx 600 index as Paris and other French cities prepared for ‘Act 13’ of so-called gilets jaunes protests and France’s worst diplomatic row with Italy since WW2 continued over “interference” from Rome’s finance minister. 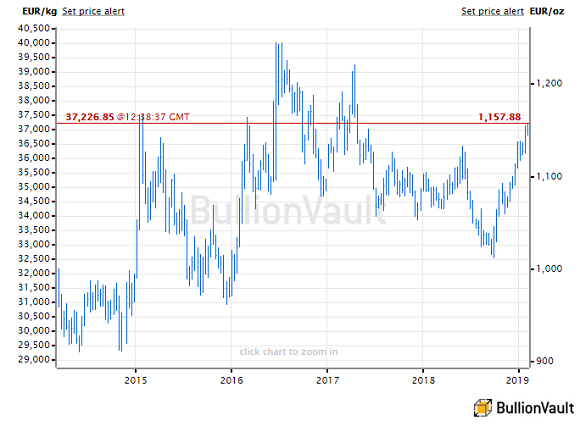 Gold priced in the Euro set fresh 22-month highs above €1158 per ounce, gaining more than 14% from last September’s multi-month lows. “Some of our growth indicators are clearly seeing easing global activity and trade volumes are being hit,” Reuters quotes economist John Sharma at National Australian Bank. Betting on US interest rates now sees a 30% chance that the Federal Reserve will cut the cost of borrowing from today’s 2.5% level by this time next year. This time last month, 20% of the betting said the Fed will raise rates by February 2020 – a likelihood now slashed to 1.4% according to data from the CME derivatives exchange. As gold in Dollars headed for its first weekly drop in three on Friday, record-high retail gold prices in No.2 consumer nation India look set to boost household selling of jewelry, says the India Bullion and Jewellers Association (IBJA), with scrap flows for the first 3 months of 2019 likely to reach 25 tonnes – some 75% greater than the same period last year. Back here in London, around 100 protesters yesterday demanded that the Bank of England release the 31 tonnes of gold it apparently holds in custody for Venezuela to the government of Nicolas Maduro – a move that would defy both US sanctions and a request from the Latin American state’s widely-recognized interim president Juan Guaido. Besides Williamson, the protesters – called “deluded left-wingers” by the Conservative MP who last month asked the Bank of England to continue refusing the Maduro government’s requests – included former Labour MP Ken Livingstone.